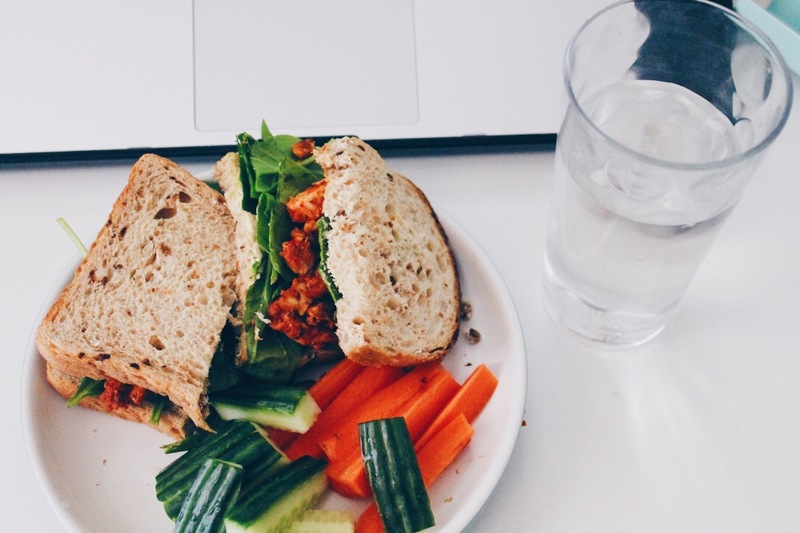 So I thought I'd switch it up a little today and share with you what I eat on a day. I might do more of these If this one goes ok but for now here we go. I thought I'd give it a bit of a subheading to tell you what kind of day it was because I know that always influences my food choices. This particular day, I hardly moved (apart to make food, grab water or go to the toilet) from my desk. It's now exam week and revision is in full swing. So here's what I ate on this particular day. I didn't want to waste time with anything too over the top (which I never do when it comes to breakfast- I can never be bothered). So, today I made sure to stay hydrated so started the morning with a glass of water and once that was gone had some apple juice. 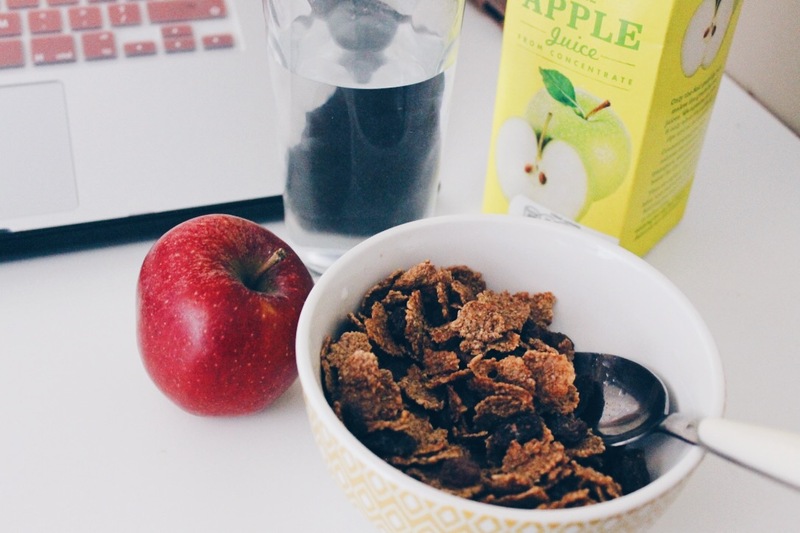 I had some sultana bran which I think, while probably as full in sugar as most cereals, is a lot better than many cereals out there. I usually also add some extra raisins on top to mix in. I also thought I'd add an apple to bulk things up a little more which I grabbed later on when I got peckish before lunch. On some granary bread, I put a small bit of flora on before adding a handful of spinach as well as some of my favourite Tesco Spicy Chicken Pieces. This is already cooked which is super handy however, it's not the most cost effective and doesn't have the longest sell by date so, in the past, I have made my own which is definitely something to try out instead of buying the ready made pack if you have more time. I also thought I'd have some cucumber and carrot sticks to munch on throughout the afternoon. I already had a batch of my Quorn chilli made up in the freezer so I just defrosted that, boiled some brown rice and enjoyed one of my favourite comfort foods. If you're interested, the chilli includes Quorn, tinned chopped tomatoes, tinned kidney beans, a red bell pepper, a fresh chilli and my dad's (not so) secret ingredients: Old El Paso Chilli Spice Mix. 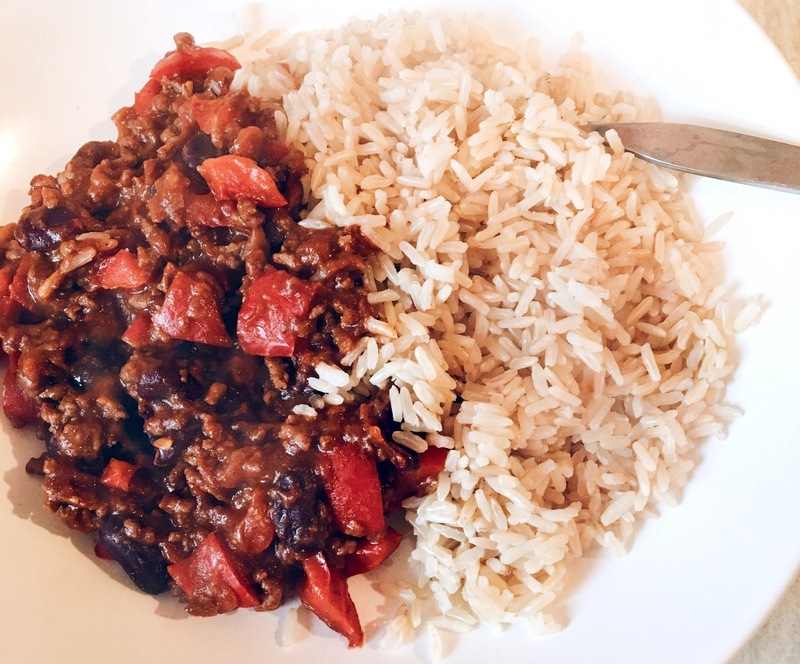 It's such a quick and easy chilli to make even if it is slightly cheating. Plus, making a big batch is so easy and beneficial for days like this when I don't want to faff around with preparing a full meal. So there's more first what I eat in a day; let me know if you'd like me to do more of these in the future.